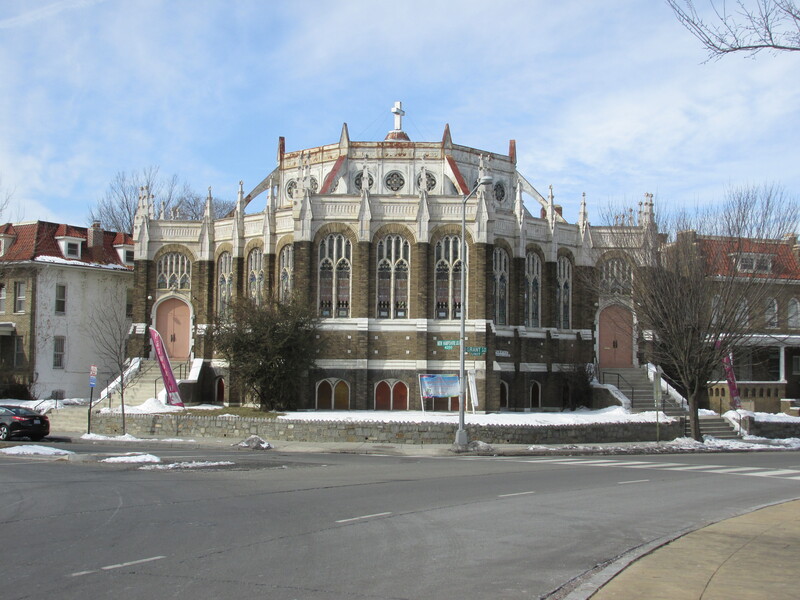 Early History of Petworth Methodist Church | Park View, D.C.
One of the early buildings on Grant Circle is the Petworth Methodist Church. 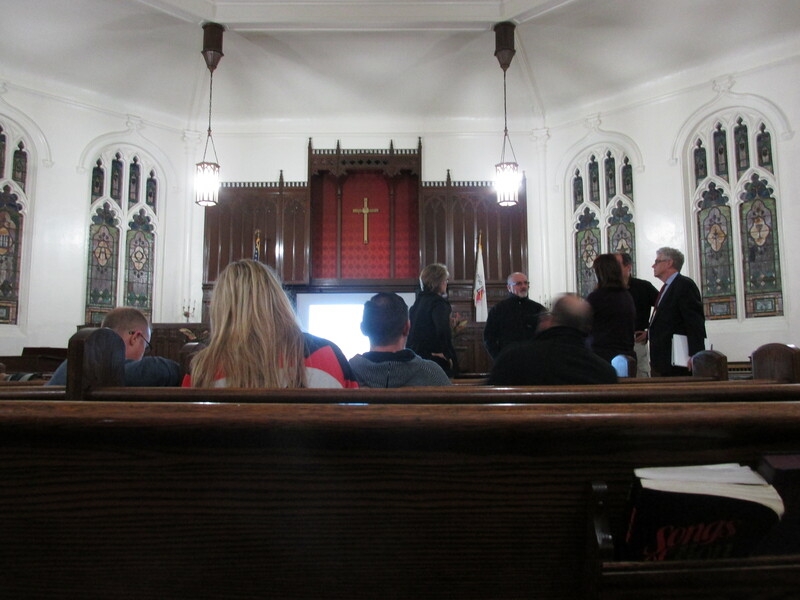 The current church was dedicated in 1916, making it an early Petworth structure, yet it wasn’t the first location of the Petworth Methodist Episcopal Church, nor the first building for area Methodists. The original site of the Petworth Methodist Episcopal Church was on the northwest corner of 8th and Shepherd streets, NW. The property for the first Methodist church building was a gift of George W.F. Swartzell. With a congregation of 42 members, the cornerstone for the one-story red brick building was laid on April 23, 1906. The chapel was completed and dedicated on October 14, 1906. The original building was small as none knew if the congregation would succeed or not, but in less than a year the church structure was crowded and it became impossible to house and seat all the congregation. By May 1909, plans were made to enlarge the edifice. The new auditorium was designed by architect William J. Palmer and roughly seventy by eighty-five feet, with arrangements for a large choir and organ in the rear of the pulpit. The structure was to be built of brick and finished in pure white pebble-dash. However, these plans never came to pass. The original chapel of the former Methodist church at 8th and Shepherd ca. 1920, when used as a school. Image from Library of Congress. During the fall of 1914 and the early spring of 1915 the church was turned over to the United States government for a sum of $15,000 to be used as a schoolhouse for children of the Petworth district. The Petworth public schools at that time were in need of additional space. The church building was adjacent to the old Petworth School, which along with the church would also make use of portable classrooms before razing the church building and expanding the school. In April 1915 plans were made to erect a new church building. The contract was awarded to Charles E. Wire, a member of the church. Ground was broken for this building on the afternoon of July 11, 1915. On November 30, 1915, the corner stone was laid by the Grand Lodge, Free and Accepted Masons, of the District of Columbia, Hon. Alexander Grant, grand master. The building was dedicated on October 8, 1916, by Rev. William F. McDowell, resident bishop of Washington. The design of the church is Tudor-Gothic, and the octagonal shape was reportedly patterned after the architecture of the period of John Wesley, the founder of Methodism. The auditorium was designed to comfortably seat 500, and by use of the Akron system seating arrangement may be provided for 800. 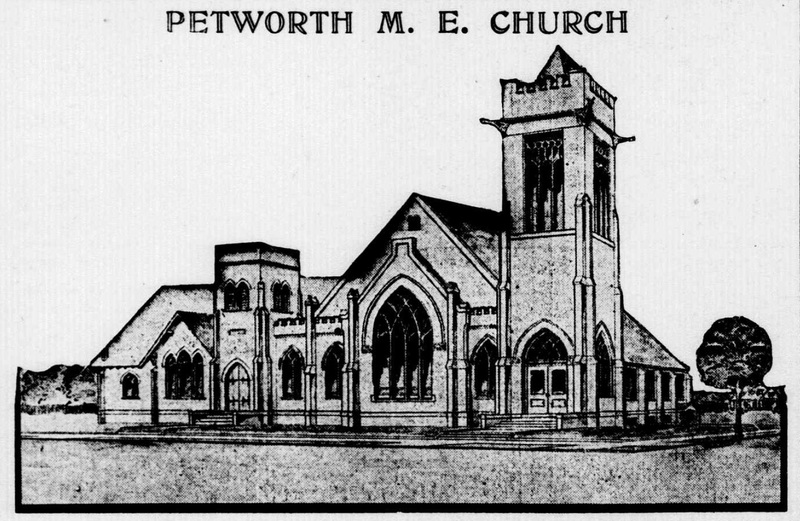 “As Petworth Methodist Episcopal Church Will Appear When Completed.” The Evening Star, July 10, 1915, Part 2, p. 8. “Church Arranges Dedication Week.” The Washington Times, September 30, 1916, p. 12. “Church to be Begun Soon.” The Washington Post, May 30, 1915, p. 15. “Church to be Dedicated.” The Washington Post, September 27, 1916, p. 4. “Dedicate New Church.” The Washington Post, October 15, 1906, p. 10. “Methodists Start Church.” The Washington Post, April 24, 1906, p. 14. “Modern Church Cold.” The Washington Post, July 12, 1915, p. 4. 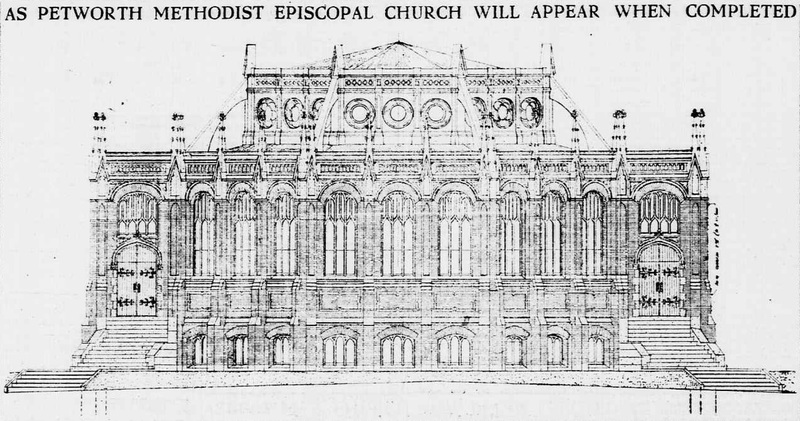 “New Church is Planned.” The Washington Post, May 16, 1909, p. CA8. “Petworth M.E. Church.” Washington Herald, July 15, 1922, p. 6. “Petworth M.E. Church.” The Washington Star, May 16, 1909, Part 2, p. 5. This entry was posted on March 6, 2015 at 7:01 am and is filed under Architecture, History. You can subscribe via RSS 2.0 feed to this post's comments.